The kids of Coastal Cuties who showed up for the play date at the Cabrillo Marine Aquarium in San Pedro (CA). The tide pools at the Cabrillo Marine Aquarium gave the kids ample hands-on time with the local sea creatures. On the 3rd of July, we visited the Cabrillo Marine Aquarium for our first time. I’d been wanting to visit this place for a few years, and I am glad we finally got down there. It’s small but very interesting and enough to keep the kids busy for a couple of hours easy. It’s also very focused on research and hands-on exhibits for all, which works well for those of us with kids. I plan to write more about our visit later in a separate post, but if you have the chance to get over to visit, please do. Oh and PS, admission is free (though a small donation per person is welcome of course). Just one of several easy festive fruit plates I took to many of our 4th of July outings last week. Cool planes overhead all thanks to McKenna’s on the Bay and their Big Bang on the Bay celebration for Independence Day 2013. Thanks to my dear friend for feeding my kid (again)! The kids were loving having dinner together outdoors before we all walked to watch fireworks. A pile of kids waiting for fireworks at Naples Plaza in Long Beach. It’s a great (free) place to gather and watch the McKenna’s on the Bay fireworks display, which now seems to be a 3rd of July Long Beach tradition (hooray!). Happy 3rd of July! Thanks for another great fireworks show, McKenna’s! Then later that day (evening) we spent time with good friends and walked to a local fireworks display. Thanks to the good folks at McKenna’s on the Bay we had a wonderful view of fireworks over Alamitos Bay here in Long Beach for the second year in a row. The kids (and adults) loved the fireworks and the new tradition that has begun with great friends and the city of Long Beach all-around. I think this was the first party we’d attended that had its own hash tag (that we knew of anyway)! T settles into his new band with new friends made at our neighbors’ pancake breakfast. The buffet was decimated because it was so delish! I had no idea our neighbors all around us were total foodies… lucky us! Our neighbors’ vast front yard made for a wonderful 4th of July morning out. Long may it (and you) wave, T! Kids in a crib celebrating Independence Day like nobody else! Next up, Independence Day! Hope you had a great 4th, RMT’ers! We kicked ours off with a neighborhood pancake breakfast put on by someone we met walking by our house while C worked hard on the front yard. She came by one day and invited us down for the morning. So glad we went as we finally found out where all the kids in the neighborhood are hanging out (young and old)! While T is oldest child of the crew by about 18 months or so, it’s still nice to see that there are many more kids in the area than we’d originally thought. T readies up for the water wars! This is a bag of Fritos topped with chili and cheese… such a genius idea especially for those outdoor holiday parties. Happy birthday, ‘Merica! There’s great people and boat watching on the 4th of July in Alamitos Bay, Long Beach. Annual Relaxation Station time on the 4th of July! T and his buddy on the kayak for the first time together this 4th of July! We weren’t even the least bit concerned about T being out there solo because he can swim now. It’s so awesome! This could very well be the best photo of me in a long time. Can I send a holiday card of me with friends on it instead of family?! We followed up breakfast with our annual trek down to the docks with our good friends at their boat so we could play and spray others in the area’s annual water fight. More splashing good times were had by all, and we could not have asked for a nicer day (sunny and 70s, and water temps near 70, too!). T and his new friend playing at Seal Beach on the 5th of July, or just another gorgeous day in Southern California! T is so excited and thrilled to want to throw mud at me. Thrilling! We found a dead crab… can we keep him?! Finally, we spent the morning of the 5th at the beach! Our neighbor (and T’s “Auntie”) had some family visiting from out-of-town, which included a boy who’d never seen the ocean. Oh the things we take for granted here in Southern California I tell you. T had a fun morning out showing his new friend the surf and sand and all the fun that goes with it! So we had a good weekend… um, no, wait, we had a good holiday, with a weekend that had yet to get started. I hope you had a great holiday if you celebrated Independence Day and a great weekend to follow, too! I’ll be away from the blog for a little bit on a mid-summer break. Enjoy these lazy (and/or busy) summer days, RMT’ers! 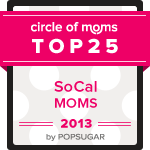 Until then, please click the above badge and vote for me, “Real Mom Time,” in the Circle of Mom’s 2013 Top 25 So Cal Mom Blogger contest! You can vote daily through Tuesday July 30! You can vote on your phone, tablet, or computer, on a network or via wi-fi! Thanks to the nice reader who nominated me for this year’s contest; I hope you know who you are because I sure don’t, but many thanks! I’d really like to crack the top 25 after just missing last year at #27 (aww!). Thanks for your ongoing support, RMT’ers, and don’t forget to VOTE!